NBC 6's Erika Glover reports on the robbery that occurred in Fort Lauderdale in which people who witnessed did nothing. 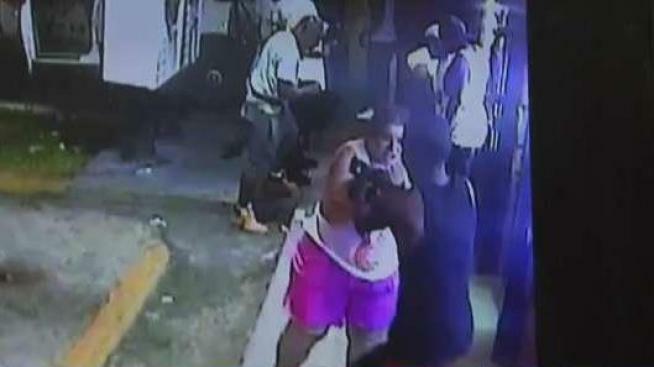 A Florida liquor store clerk was robbed of more than $11,000 as a group of witnesses stood idly by while she fought to fend off the suspect. The incident was captured on surveillance video outside the 19th Street Liquors store in Fort Lauderdale. According to Ash Raff, the store's manager, the employee was picking up money to deposit. Video shows the woman holding a black bag as she walks out of the store. A man then ambushes the woman and wrestles the bag out of her hands while several bystanders watch. The suspect flees the scene on foot. "We don't deserve this because we fight to make a living," Raff said. He believes the robbery was planned. Raff said the employee has been picking up money from the liquore store for 15 years and the suspect may have known which days she stops by. The suspect was seen on surveillance video loitering in front of the store for more than an hour before she arrived, appearing to be waiting for the victim, Raff said. He said he usually walks his colleague to her car, but on the day she was robbed he was not working. The woman was not injured in the attack, but Raff said she is still shaken up over the incident. Anyone with any information on the robbery is urged to call Broward County Crime Stoppers at 954-493-8477.